A luxury 18th century apartment recently restored by the current owners, in the heart of the old historical centre of Cisternino. The apartment has the added benefit of a private outside rooftop terrace where you can enjoy a glass of vino and eat alfresco. Step out the front door and down the steps straight into the old town, live the dream of the Italian lifestyle and see how the local Italians really live their wonderfully healthy life-styles. Stock up on fresh meat, cheese, fruit and vegatables at the street market every Monday. Enjoy a locally made gelato and watch the world go by. Visit one of the many gastronomic restaurants and enjoy the best of Italian cuisine. We first visited Cisternino in 1994 with our young family and instantly fell head over heals in love with this beautiful town, the way of life and its people. So much so we decided to buy and restore this charming apartment. We have worked hard and continue to work hard to keep this property up to a high standard for our family to enjoy as well as our guests. 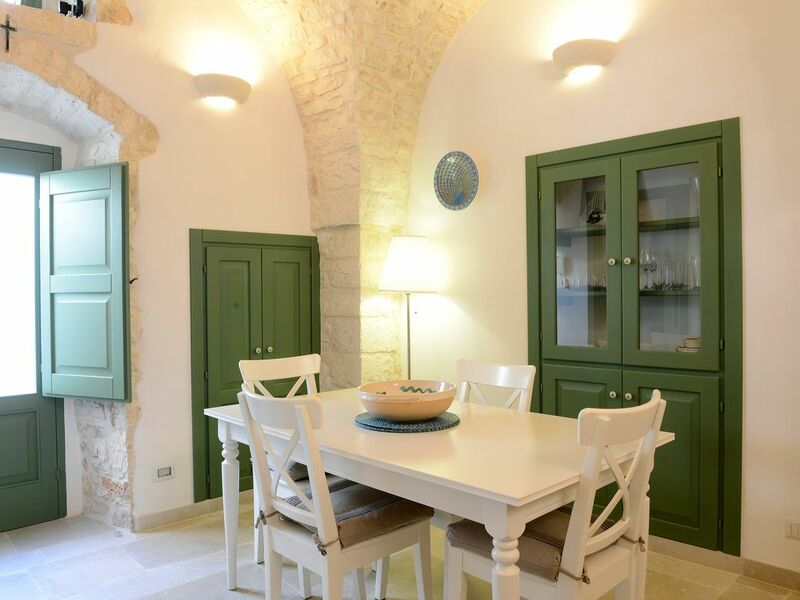 This property captured our hearts, mainly due to its fantastic location within the historic centre of Cisternino. It was in need of much TLC and total renovation but we could see its potential. Once the old plasterwork was stripped back we could enjoy the beautiful stonework that had been hidden for so many years. The high vaulted ceilings, the light and the space. The main benefit of this property is the location. The social aspect of the open-plan living area, and the attention to detail in the way it has been tastefully and comfortably furnished throughout. The roof-top terrace gives you private outside space to enjoy a glass of wine, read a book or enjoy a home-cooked meal. We enjoyed our 5 day stay at this well equipped apartment. Centrally located to Alboborello, Locorotondo and the coast. Parking is within easy reach of the apartment. There are also many good eating places close to this apartment. Angelo was an extremely helpful host. We would happily return to this lovely apartment. Beautifully restored apartment in excellent location in town. Wonderful holiday, Cisternino lovely town itself and perfectly located for visiting surrounding towns/villages/countryside. Markets wonderful, eating out a real pleasure, apart from Monday's when nothing open! Only issue with apartment was lack of wardrobe space. Thank you for your review of Casa Maria. Glad that you enjoyed your stay and we hope that you will visit again. Maybe staying at Trullo Stefano just 3 kilometres outside Cisternino in Marinelli contrada. This property is very spacious and can accommodate 6 people. Thank you for your comment about wardrobe space which we will review. We had a lovely 10 day stay in Casa Maria in Cisternino. The apartment is cozy, spotless and very well located in the town -- steps away from the enoteca, forno, butcher, fish market, and restaurants... everything you need for immersion into the local 'scene' and culture. The market on Mondays was a wonderful window into local life. We were able to use the flat as our base for exploring much of Puglia including the nearby white towns of Martina Franca, Alberobello, Ostuni, etc. (which are generally less than 30 minutes away). We enjoyed hiking in the countryside through the olive groves and paths and in the small national park located on the road out of town, and noted that there are a number of small marked biking roads that would be fabulous to explore. The only issue we had with Casa Maria was that the wifi was very spotty. We needed to go to the local bar for fast and dependable wifi in order to download directions etc. as we did not have cell service from the US while vacationing. (Check out the Mozzarella Bar!). We much appreciated the central heat, as the nights were very chilly in April. The casa is very well equipped, and we even made a few meals from our purchases at the markets. Angelo, the caretaker, was very responsive and service oriented. We enjoyed our time in Cisternino at Casa Maria immensely, and have fallen hard for Puglia. Thank you for our home away from home. Thank you for your comments about Casa Maria which future guests will find very helpful. Apologies about the wifi connection which there were problems with, but these have now been fixed I understand from Angelo. We look forward to welcoming you back to Puglia in the future and especially Casa Maria. An absolute gem of a property, brilliantly restored. We are at risk of running out of superlatives to describe our stay in the historic centre of Cisternino. The standard of the property's restoration and the owners attention to detail in providing virtually every item, gadget or utensil to make our stay totally relaxing and effortless is commendable. My only concern would be being able to book again as Casa Maria merits a long long reservation list. The owners ticked every box from our initial enquiry right through to the booking and beyond. Thank you to Stephen & Kate for ensuring a wonderful holiday. Really enjoyed our stay, what a lovely place. It all looked so brand new, we could not work out if we were your first guests. Lovely town with lots to do and the rooftop terrace is perfect for evenings.